Are you seeing an allowed memory size exhausted error in WordPress? This is one of the most common WordPress errors, and you can easily fix it by increasing the php memory limit in WordPress. 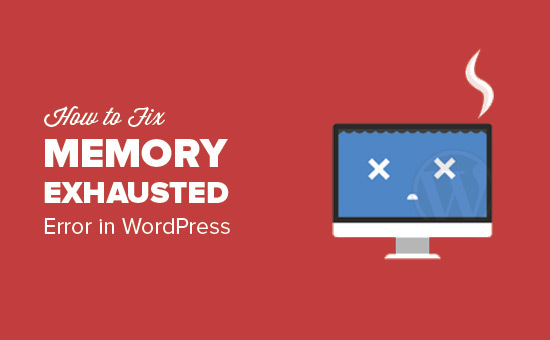 In this article, we will show you how to fix WordPress memory exhausted error by increasing PHP memory. 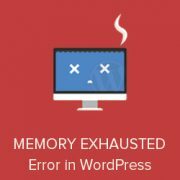 What is WordPress Memory Exhausted Error? WordPress is written in PHP, which is a server-side programming language. Every website needs a WordPress hosting server for it to function properly. Web servers are just like any other computer. They need memory to efficiently run multiple applications at the same time. Server administrators allocate specific memory size to different applications including PHP. When your WordPress code requires more memory than the default allocated memory, you get to see this error. By default, WordPress automatically tries to increase PHP memory limit if it is less than 64MB. However, 64MB is often not high enough. Having said that, let’s see how to easily increase PHP memory limit in WordPress to avoid memory exhausted error. First you need to edit the wp-config.php file on your WordPress site. It is located in your WordPress site’s root folder, and you will need to use an FTP client or file manager in your web hosting control panel. This code tells WordPress to increase the PHP memory limit to 256MB. Once you are done, you need to save your changes and upload your wp-config.php file back to your server. You can now visit your WordPress site and memory exhausted error should disappear now. If you are new to WordPress, then take a look at our beginners guide on how to copy and paste code from the web. We also have a step by step guide on how to find and edit wp-config.php file. Note: If this solution does not work for you, then this means your web hosting service provider does not allow WordPress to increase PHP memory limit. You will need to ask your web hosting provider to increase your PHP memory limit manually. That’s all we hope this article helped you solve WordPress memory exhausted error by increasing PHP memory limit. You may also want to see our step-by-step beginner’s guide to troubleshooting WordPress errors. I love you ! you’re a life saver ! I wish I known that earlier. Now | lost a lot of traffic for my site. Hopefully it is fixed now! Thank you so much. That worked great for me! Great! It works well. Thank you so much. Dead on !! Thanks a lot. Then I could no longer post! Panic! Everybody PANIC!!! I enabled debug mode. I got my debug report. I saw the memory exhausted reported. Then I found this page and gave it a try, thinking, “This probably won’t work. I’ve made too many changes to the theme and some of the plugins to work the way I want. Something somewhere got MuNgEd. Nope. Not at all. This one line of code solved it and got be back up and RUNNING!!!! Yay for me!!!! YAY FOR YOU!!!! Thank you so much. It works very fine. Thank you so much for this quick and easy fix! Thank you very much. It really worked. I have tried this, and now my entire admin panel and website are down, all blocked by that 500 error…. I cannot access anything anymore, and therefore can’t use the File Manager again to remove the change. I’m completely lost, any chance you can help me? If you have access to cPanel dashboard then you can undo the changes from the file manager section there. Alternately, you can contact your hosting provider to help you fix this. I contacted my hosting company and requested them to increase my PHP memory, this resolved the issue. Thanks A Lot ! Saved me. Please see our article on how to increase php memory limit in WordPress. Thank you! Thank you! Thank you! VERY Helpful! My issues got solved completely based on your detailed information and help. I’m not as good at this stuff as I need to be, so I’m still struggling with this. I’ve changed that to 2048 and 4096 with no change. It does say ‘That’s all, stop editing! Happy blogging.’ in the Sample config.php but not in the actual one. Thank you this worked perfectly! Thanks…just moved from Joomla to WordPress and hit this issue. Thanks for the easy fix. You are genius. Thanks A Lot ! Saved me. You are a life saver. I was about to start throwing breakable objects. Omg, this fixed it! THANK YOU!!! Thanks for sharing this information, it really helped me to fix word press website. It’s 1:53AM and because of you, I can sleep in peace now. THANK YOU! define( ‘WP_MEMORY_LIMIT’, ‘256M’ ); worked all time. Thank a lot for the solution. you guys are amazing you solved most of the issues i encounter since started working with WordPress. I’ve tried to expand my limit but it didn’t work. When I refresh the page, it changes what’s after “/wp-includes/” and the line number, but none of those files have a place to expand the size. Any tips? Try increasing it to 512M. There still isn’t enough memory for whatever theme you’re running. Good luck! P.S. make sure that you have more than 512M of memory. Ask your hosting provider. Great! It worked. Thank you so much !!! Thank you so much for sharing this. Helped me a lot! It works! Thanks for the suggestion. But I have a question. I find another article said that changes WP_MEMORY_LIMIT in default-constants.php. Is there any different between this two methods? I have the same question. Can you explain the difference? Why use one over the other? The constants file is for settings that don’t change, editing the config file is where you would make changes that can be reverted later when you are no longer receiving the error. Thank you very much for this fix. Wow, this worked like a charm and it was easy peasy! Thanks so much! I looked everywhere for a solution and even called the host searching for an answer. Fixed it PERFECTLY! Thanks so very much! Get 25% OFF on Domain.com and save big on your domain names. Get 25% off MaxCDN, the same service that we use to make our site super fast.